In the first of a two-part interview, John Dorney talks to Brian Hanley, author of The IRA A Documentary History, 1919-2005, about the Irish Republican Army in the 20th century. Our review of The IRA – A Documentary History is here, by Padraig Og O Ruairc. Listen to the interview below by clicking on the links. Since 1916, groups calling themselves the Irish Republican Army have used force to try to break the connection between Britain and Ireland on behalf of the Irish Republic. Starting with the Irish Volunteers through to the Anti-Treaty IRA of the Civil War, to the split between the “Provisional” and “Official” IRA in 1969 to the various splinter groups claiming the title today. Brian argues that, although there are shifts and breaks in this history, there also continuities. At its most basic, “the IRA” has always represented a belief in the legitimacy of armed force in pursuit of Irish independence. We discuss the idea, held by the IRA for many years, that after the usurpation of the Irish Republic by the Anglo-Irish Treaty of 1922, the IRA’s Army Council was the provisional government of Ireland, pending the overthrow of British-imposed institutions. Did the IRA represent an armed challenge to democracy in Ireland, north and south? We talk about whether this has meant that the IRA represents a strain of anti-democratic militarism in Irish politics. That is represented an armed challenge to democracy – a view advanced by many, both north and south. We also talk about the ideological shifts in the IRA over the years, placing it sometimes on the far-left, sometimes on the Catholic right and at one time even into collaboration with Nazi Germany. Finally, if there is one constant in the history of the IRA it is the idea that organisation represents the assertion of principle against weak-hearted “politicians” and compromisers of the Republican ideal. Brian discusses the import of the idea of betrayal in the history of the IRA. Brian Hanley (on left) at the launch of "The Lost Revolution". Brian Hanley is the author of; The IRA: 1926-1936, and with Scott Millar, The Lost Revolution, The Story of the Official IRA and the Workers’ Party. He teaches History at St Patrick’s College, Dublin. A useful review of The IRA 1926-1936 can be found here. Perhaps the best review of the Lost Revolution is here at Dublin Opinion. 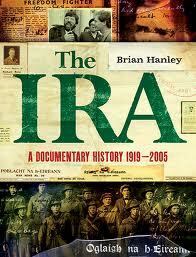 Another review of The IRA – A Documentary History is here at the Cedar Lounge Revolution. Written by: John_Dorney on 17 December, 2010.on 10 September, 2011. 7 Responses to "Brian Hanley on the IRA – Part I – Ideology"
You can listen to Brian Hanley talking to Pat Kenny on RTE here.